How Far is North Point Emerald? North Point Promoters Emerald is one of the popular residential developments in Uppilipalayam, neighborhood of Coimbatore. It is among the ongoing projects of its Builder. 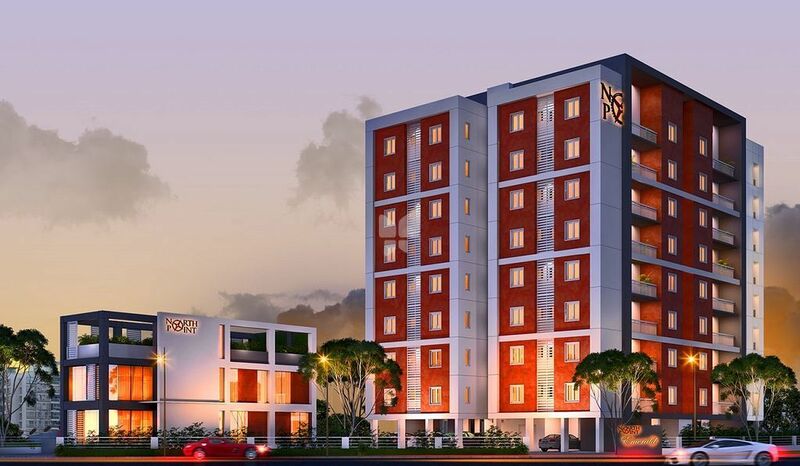 North Point Emerald, at Rajiv Gandhi Nagar in the bustling city of Coimbatore, Tamil Nadu, is a luxury residential complex, reflecting the need of modern lifestyles and contemporary aesthetics. Perks Arch / On the 80 Feet Road, Rajiv Gandhi Nagar, Coimbatore, Tamil Nadu, India. The building is RCC Framed Structure with Bricks / Fly-ash Masonry wall. Anti-Skid Tiles and Wall ceramic tiles up to False ceiling Level. Flooring Anti-skid tiles and wall ceramic tiles up to 2’ height. UPVC openable with pinhead glass and necessary hardware. MS Grills grouted on wall with Enamel paint finish over metal primer as per Architects design. UPVC sliding glass door as per Architects specification. All flats will have 3 phase connection with independent energy meters. ISI Mark quality wire will be used for the entire Building. TV, Telephone point in Living and all Bed rooms. 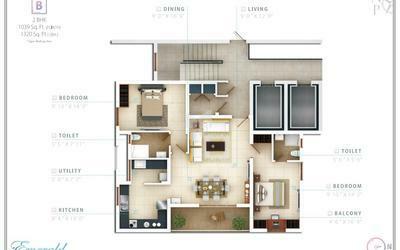 For 3 BHK, Ac provision will be for 2 bed rooms and for 2 BHK, Ac provision will be for master bed. DTH Provision in Living and Master Bedroom. Adequate Light, Fan and Power Points will be provided. Good Quality CP and sanitary fittings (Floor Mounted). SS sink with drain board in the kitchen and SS sink Single Bowl in the utility. Reticulated piped gas supply for kitchen. to be finished with Cement based putty and two coats of premium Emulsion Paint. Landscape on all suitable open spaces and pavements with Paver Blocks as per Architects design. Covered Car Parking / Reserved Open Parking. Compound wall in outer periphery with Gate. Well Equipped Gym / Multi- Purpose Hall. North Point Projects is on its way to establishing itself as a reputable builder and developer of luxury residential and commercial projects across south of India. Our maiden project, North Point Emerald, at Rajiv Gandhi Nagar in the bustling city of Coimbatore, Tamil Nadu, is a luxury residential complex, reflecting the need of modern lifestyles and contemporary aesthetics. We have the greatest pleasure in presenting 31 privileged families a wonderful opportunity to buy a home they could cherish for a life time. Designed with greatest attention to detail, this exclusive signature residential project offers superior designing in terms of space management, ample cross ventilation and spacious rooms with ample natural sunlight. We seek to build not just vibrant and sustainable homes but communities as well. Thus our project has been conceptualized to provide you with a beautiful home in a beautiful environment within a close-knit community. Welcome home to a home after your own heart.